Moving day is very quickly approaching. It's like stress levels to the max over here! My apartment is a mess of boxes and I'm just trying to keep calm and be ready for the fact that in 1 week...I'm gonna pack up and ship on out. Emotional preparations aside, I also need to try to keep the stuff we have to bring with us to a minimum, so I've needed to do some pantry cleaning. That, my friends, is how these big, beautiful cookies were born. 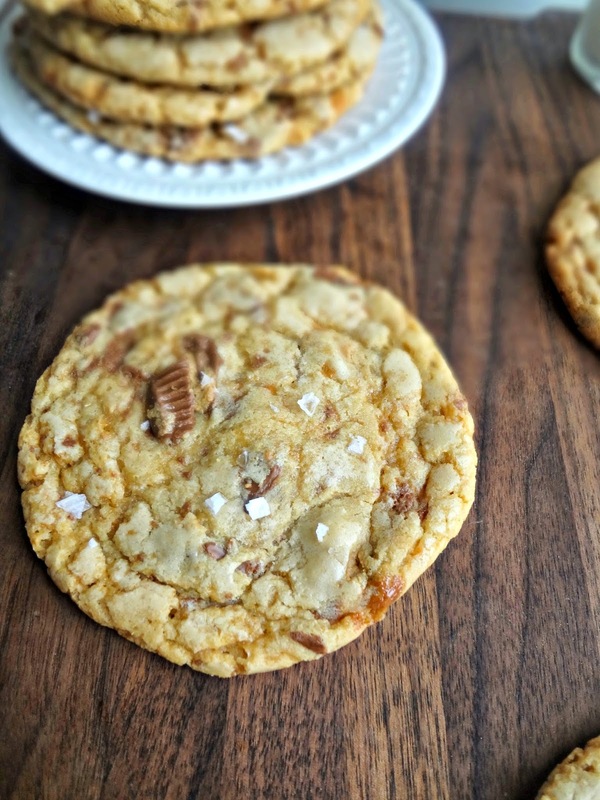 I've had half a bag of crushed Butterfingers hanging out in my freezer since I made these and these. And I still had a good amount of mini peanut butter cups from this cookie recipe I made a little over a month ago. And those had to go! So I thought...hey...let's make some cookies. And I'll use that delicious cookie base recipe from Baker by Nature that I used for that cookie recipe I just mentioned-it's perfect for mix-ins! And...guys...they COULD NOT have turned out better!! These are essentially a browned butter chocolate chip cookie base but...it straddles the line between that and a peanut butter cookie. 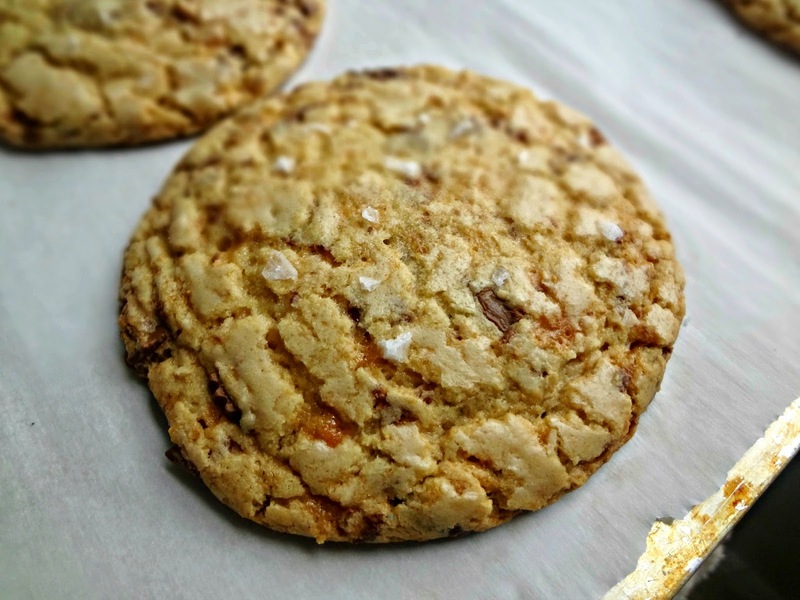 I added a couple tablespoons of peanut butter to the dough-just enough to highlight the flavors of the butterfingers and peanut butter cups, but to still let that yummy browned butter/brown sugar flavor shine through! 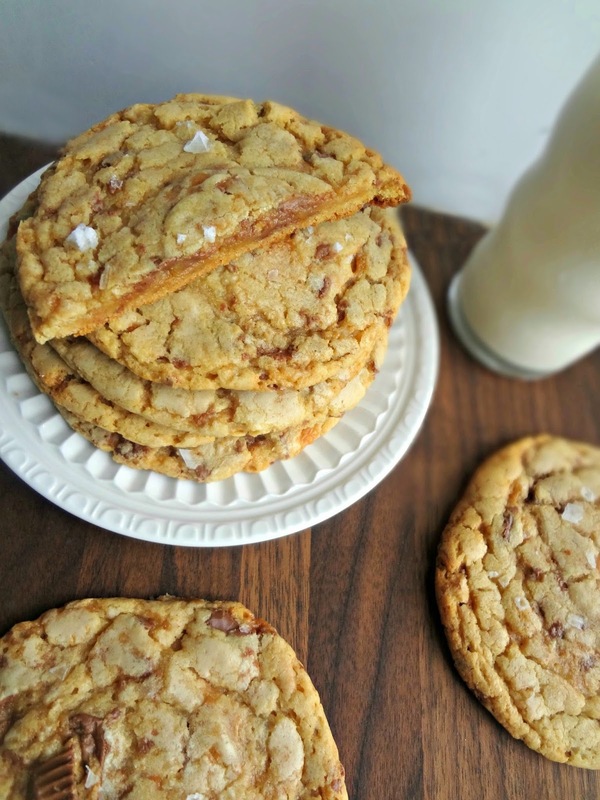 And they are BIG, sturdy, chewy, gooey, perfectly textured, perfectly delicious cookies. They'd be perfect to give or send someone as a gift. PLUS-they're pretttyyy, just look at those crackly tops! I DIE over crackly tops! And the taste aghhhh! You bite in and you get the crunchy toffee-peanut butter flavor of the Butterfingers throughout, and these awesome chunks of a bigger chocolate peanut butter punch from the pb cups, and there's the complexity of the browned butter and that hint of peanut butter that lingers...and...of course...there's sea salt (I used some gorgeously large cyprus flakes). Sweet and salty allll the way! 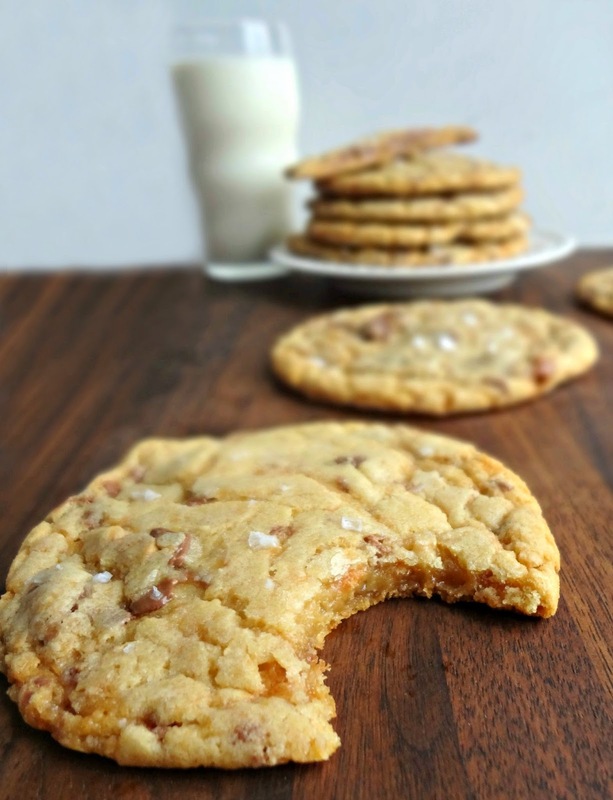 Fun story: I had a giant cookie at a restaurant recently and all I could think the whole time I ate it was how much better it would've been with salt on top. I am an addict. Line 2 large cookie sheets (or just 1 that you'll re-use in 2 batches) with parchment paper or silicone baking mat(s). Preheat oven to 350F degrees. In a medium bowl, whisk together the flour, baking powder, and 1/2 tsp. salt. Using a stand or hand mixer, beat the peanut butter, vanilla, and sugars into the butter for a couple minutes, until it lightens a bit and gets sort of fluffy (it will be a very greasy looking mixture). Add the dry ingredients in thirds, mixing after each addition until just combined. Stir in the chopped peanut butter cups and crushed Butterfingers until evenly distributed throughout the dough. Using a large (1/4 cup) cookie scoop, measure out large balls of cookie dough and place them on the baking sheet(s), leaving plenty of room in between (I was able to fit 8 cookies on my very large cookie sheet). Sprinkle with sea (or kosher) salt. Bake 13 minutes (ovens vary, however, so the time may as well), until golden around the edges (if baking 2 sheets at once, be sure to rotate the pans for even baking). Remove and allow to cool on the sheet for 5 minutes. Then, transfer cookies to a wire rack to cool completely. Serve warm! 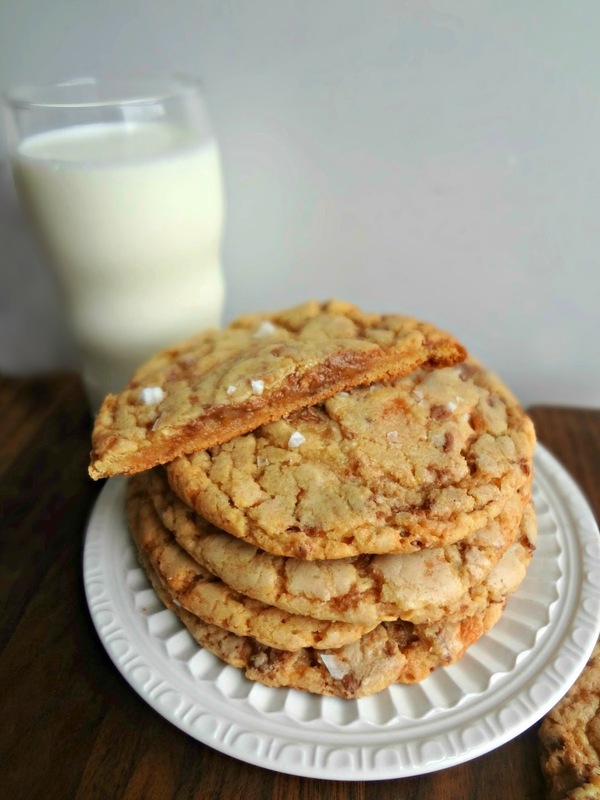 Store leftover cookies in an airtight container for up to 5 days.